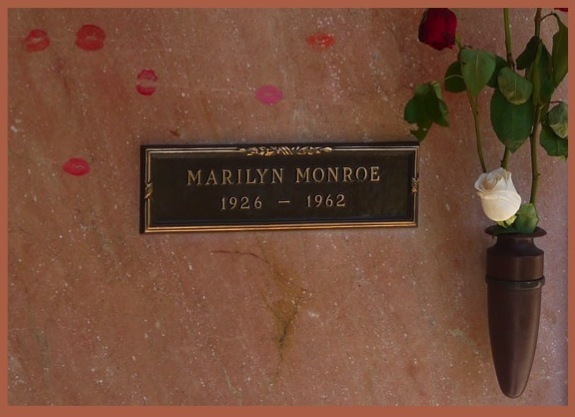 Every time I’ve visited Marilyn’s grave—and given that I worked in Westwood when I was younger, it’s been quite often—there are fresh flowers and the imprint of red lips on the stone. Westwood Memorial Cemetery persists in cleaning them off, but fans persist in leaving them, and even after Joe DiMaggio stopped having roses delivered weekly to Marilyn’s grave (for some twenty years), the fans also kept up that tradition. I last visited her in 1993. Although we buried my dad, Tom, at the veteran’s cemetery in Riverside, his memorial service was held at Westwood. I stepped out for air at one point and wandered the grounds, eventually going over to say hello to Marilyn. The flowers and red lips were in place, as always. As I turned back to the memorial chapel I saw my dad standing outside in the Marine Corps dress blues we’d buried him in—looking sad, his hat in his hands. He glanced up, our eyes met, he acknowledged me with a nod, then he was gone. You are currently browsing the archives for the dad	category. WordPress 5.1.1 and delivered to you in 0.872 seconds using 30 queries.